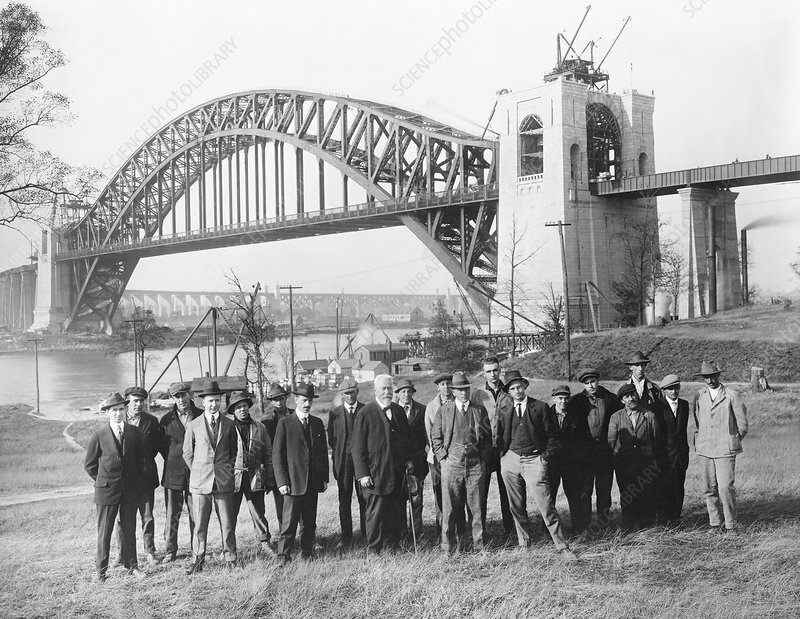 Hell Gate Bridge engineers, in front of the bridge they designed and built. At centre is the bridge's designer, Austrian-US engineer Gustav Lindenthal (1850-1935, white beard). To his right is his chief assistant Othmar Hermann Ammann (1879-1965, moustache). This steel through-arch railroad bridge, built from 1912, was opened in September 1916. It spans 310 metres, crossing Hell Gate, a tidal strait in New York's East River. At the time, it was the world's longest steel arch bridge. This view looks north, with the approach viaduct curving away to the right in the background. Photographed on 11 October 1916.